I love soup all year long. I love soup every week. I love soup of all kinds. It’s my thing, so to speak. You get it, I love soup. When I start making up goofy poems about something, you know that it’s serious. Soup is on my menu at least twice a week. What is more soothing than a warm bowl of comforting soup? 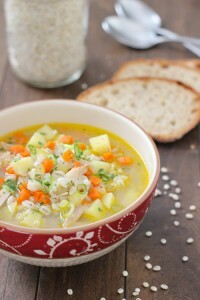 Chicken soup is the ultimate comfort food and supposedly the remedy for all diseases, and I can see why. This is a very simple variation of Chicken Soup with the addition of barley instead of the usual noodles or rice. 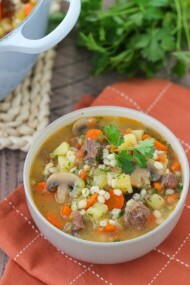 Cooked barley makes this soup creamy and makes my belly feel really cozy as I’m sipping each spoonful. Another awesome trait of this soup is that it can be made ahead of time and tastes great as a leftover the next day and you can even freeze it. Place the chicken, bay leaves, peppercorns and water in a large pot. Bring to a boil, season with salt and cook until the chicken is tender and the meat is falling off the bone. Strain the broth through a fine mesh sieve lined with a cheesecloth or a paper towel. When cool enough to handle, take the meat off the bone. Set aside. You will have about 8 cups of broth and 1 cup of meat. 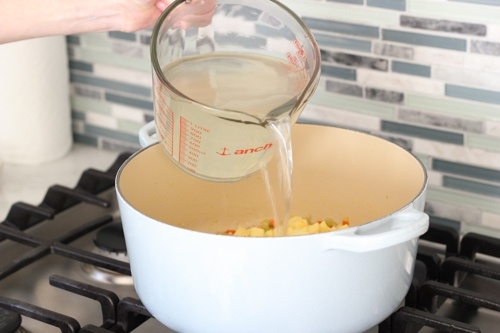 If you have chicken broth and cooked chicken on hand, you can save some time by using it instead of starting from scratch. 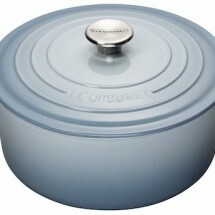 Rinse out the same pot that you used to cook the broth. Melt the butter (or use oil) on medium heat. Add the onion, carrots, celery and garlic. Season with salt and pepper. Cook for about 7 minutes, until the vegetables are tender. Add the barley, potatoes, the reserved broth and chicken. 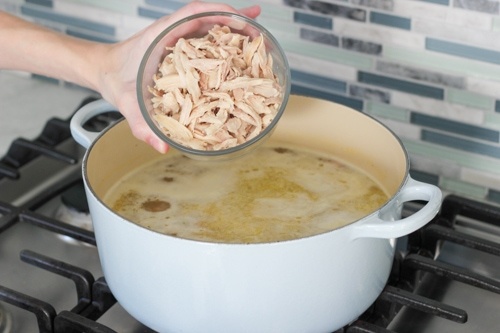 If you are using cooked chicken breast, do not add it to the soup until it’s completely cooked and right before you turn it off, otherwise the meat will be really tough and rubbery. 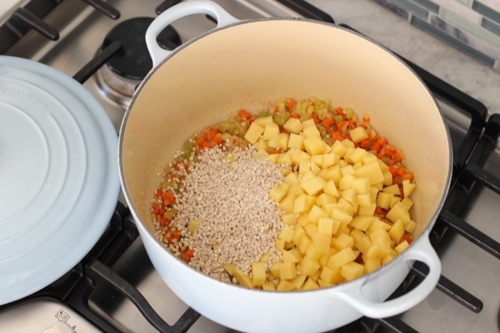 Bring to a boil, reduce to a simmer and cook for about 30 minutes, until the barley is fully cooked. Adjust the seasoning with salt and pepper, if needed. 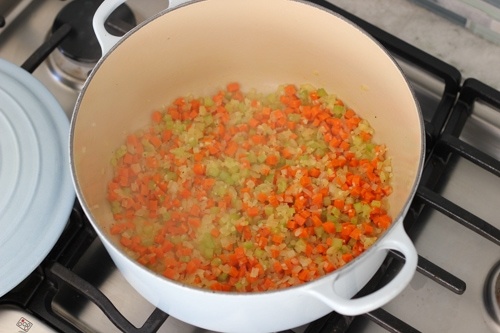 You can also add more or less broth or water, to adjust the thickness of the soup. Off the heat, add the fresh herbs. This soup freezes well, so making a big batch like this one is a great idea. Place the chicken, bay leaves, peppercorns and water in a large pot. Bring to a boil, season with salt and cook until the chicken is tender and the meat is falling off the bone. 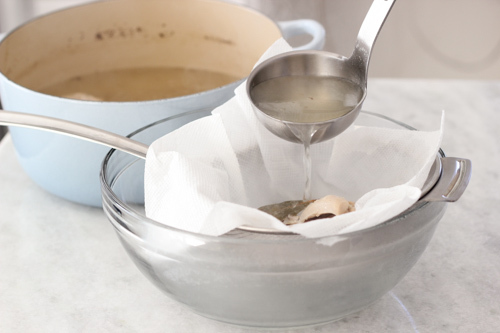 Strain the broth through a fine mesh sieve lined with a cheesecloth or a paper towel. When cool enough to handle, take the meat off the bone. Set aside. You will have about 8 cups of broth and 1 cup of meat. 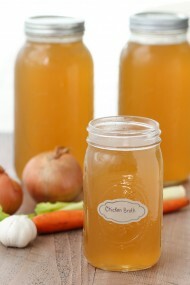 If you have chicken broth and cooked chicken on hand, you can save some time by using it instead of starting from scratch. Rinse out the same pot that you used to cook the broth. Melt the butter (or use oil) on medium heat. Add the onion, carrots, celery and garlic. Season with salt and pepper. Cook for about 7 minutes, until the vegetables are tender. Add the barley, potatoes, the reserved broth and chicken. Bring to a boil, reduce to a simmer and cook for about 30 minutes, until the barley is fully cooked. Adjust the seasoning with salt and pepper, if needed. 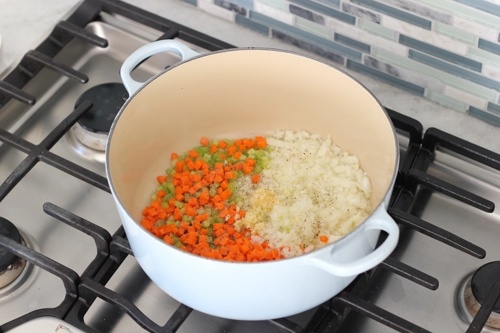 You can also add more or less broth or water, to adjust the thickness of the soup. Off the heat, add the fresh herbs. Yum!!! This looks delicious olga! Want some now 🙂 Gonna try making it. Made your soup olga!! It was delicious! We love barley, our favorite grain. we usually make a barley soup that has veggies, tomatoes, beans, zucchini etc and we love it too, but with no veggies on had this was good and tasted Ukrainian. 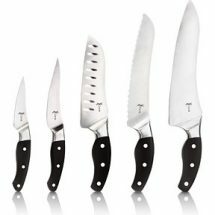 Im finding your recipes are great… Because i know how to cook, but i need a makover in cooking,t my husband cant stomach much, just the way he is, mostly vegetarian. 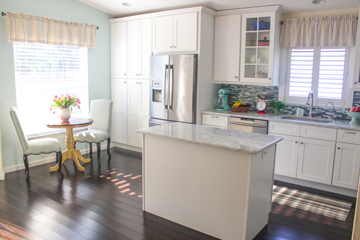 Im finding that u cook light since your mgv probably, and u know what, its to our benefit. Because thats what im looking for!!! That’s great, Lez! I’m so glad that you enjoyed the soup. It’s a very simple one for sure. I do like to cook very light and healthy meals. I can’t even eat many of the things that I post here on the blog:). My favorite foods to eat are ones that will make me feel good afterwards. Thanks for catching that, Olga:). Thanks for the recipe, I love barley but not many recipes call for it. Also fun to see you use drumsticks, I do that quite a bit when making chicken soup and rarely see them used when making soup. You’re right, Tallya. I noticed that too. Barley is very rarely used. I really like the flavor and texture. It’s something I always have in my pantry. 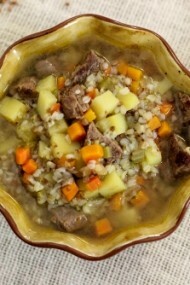 I’ve had to create many different recipes with barley to satisfy my cravings. I’m so glad to hear that you enjoyed the soup. Drumsticks and wings are my favorite to use in soups if I don’t have any Chicken Broth on hand. Thanks for taking the time to write. Thanks for taking the time to write, Alla. That’s so great, Liliya. 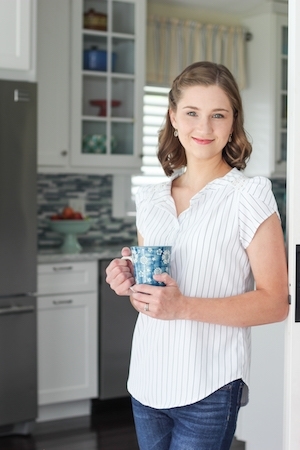 I totally know what you mean – it means so much to me when my husband likes something I cooked. Olga this was easy, quick and delicious! Thank you! and congratulations on your baby boy! 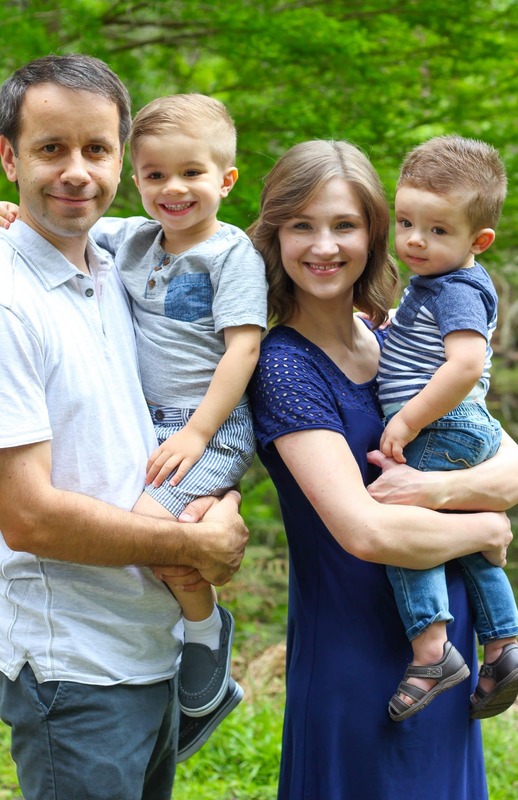 God bless your little family! Wish you a quick recovery! That’s great to hear, Julie. I’m so glad you enjoyed this soup. 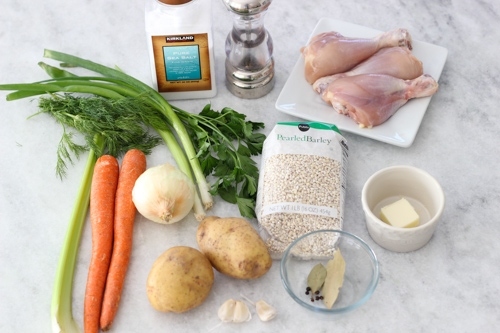 I will definitely try to make this this but I’m not sure about barley my husband and kids are very picky and celery if my kids see it they won’t eat it. Can I replace celery and barley with something else? You can just omit the celery and replace the barley with whatever you typically put in soup – pasta, rice, etc.